Tom has over 35 years juggling experience. He specializes in juggling balls, clubs and cigar-boxes. 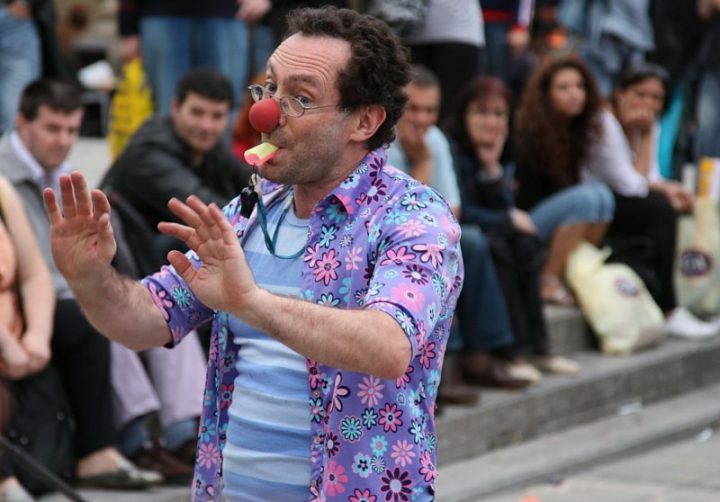 As a clown he prefers to use funny tricks rather than try to impress people with his technique but he is actually a very accomplished juggler. In addition to just entertaining people; he can also offer to teach juggling. For absolute beginners to advanced jugglers; Tom uses effective methods to instruct and encourage. Working in small groups he can get the majority of people to learn the basic 3 ball pattern within 30 to 40 minutes. Why juggle? Good question. The short answer is that it’s fun! As a sport it is ideal for learning eye-hand coordination. Everyone can learn at their own pace and it is eventually possible to do together passing balls or clubs. But it is a sport of cooperation rather than combat. And unlike many sports, it has few risks of injury. One needs a bit of space to train but no special fields or halls like football, basketball or baseball. One is also not going to be paying for using facilities like for golf or tennis. The equipment is also relatively cheap. Good juggling balls can be made oneself. Quality juggling clubs or torches cost a bit more but usually last for years. It is also a social hobby. 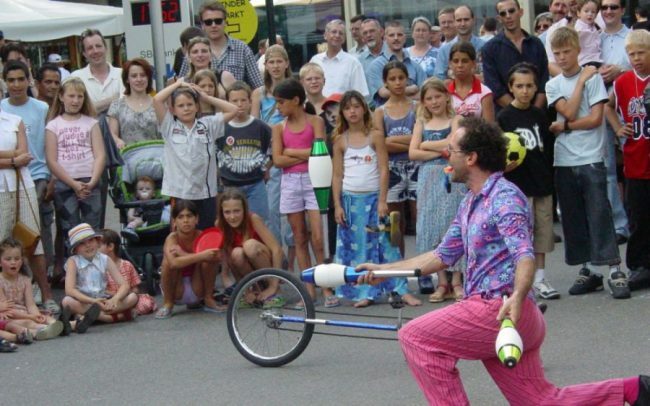 Many jugglers get together at weekly meetings or at bigger conventions. And even many of the world’s top professionals are happy to share tips and advice with hobby jugglers. At events where Tom gives workshops the participants are usually excited. This comes from actually learning something new, giving a feeling of accomplishment. So how does it work? Well, Tom brings all of the necessary equipment, which consists of balls for beginners but he can also bring extra clubs and cigar-boxes for more advanced pupils on request. Ideal are small groups up to 8 or 10 people. Children from 7 or 8 years old usually manage. Younger ones often like to try but rarely have the concentration to seriously learn during a single workshop. Unfortunately, a few young kids acting chaotic can make it more difficult for the others to learn. Tom takes his pupils step by step through the process including juggling 3 balls together. He can control the rhythm of the juggling pattern so one feels the correct timing. This is an important step that one cannot do on their own. With this method he has taught people who had tried and failed. Many people can learn on their own but it is much easier with proper help. And failure often means that people become convinced that juggling is simply too difficult for them. This attitude becomes a barrier in itself. The upshot is that having a qualified teacher is often the difference between success and frustration. Especially for kids, balloon-twisting or balloon-modelling has become popular. What kid doesn’t enjoy getting their favorite animal made as a balloon? Or parents like to learn to make them for their own kids. One can also make various hats, flowers, hearts etc. The only real limitation is one’s imagination. Yet more fun than just getting a balloon made is to be creative and do it oneself. After many requests, Tom realized that there was often interest for him not to just make balloon figures but to teach how to do it. With an improvised workshop it is ideal to limit a group to about 5 or 6 people. If planned in advance, Tom can bring additional pumps, needed for inflating the balloons and work with up to a dozen or so participants. Concentration is on the basic techniques with which one can still make dozens of different figures. Tom of course supplies the special balloons used for balloon-twisting. 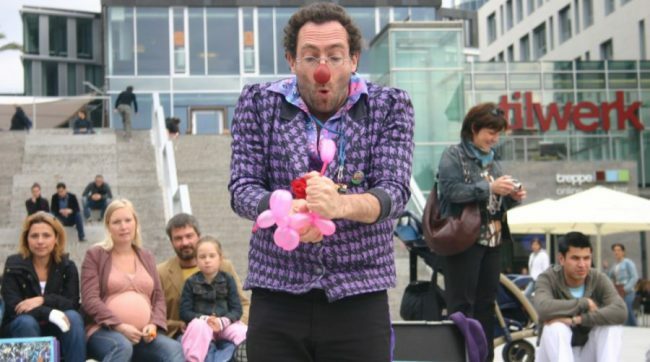 There are many places where acting or clowning classes are offered. What Tom offers is different. Rather than training acting methods Tom gives insights to his unique experiences as a world traveling clown. He learned many things as a street performer that even the best trained classical actors never do. Much of this is theory including the psychological reasoning behind many of the things he does. In a typical clowning class, one will learn a routine. One can copy it and maybe make a good presentation. Not a bad thing. But to create one’s own routines, one needs to understand the underlying sense of WHY things are funny. Consider the cliché‘ of „give a man a fish and tomorrow he will be hungry again but teach him to fish and he will always have something to eat.“ With clowning and performing, the teaching part becomes not how but why. With this answered, one can explore many possible „hows“ rather than to just repeat something by rote. Such workshops are optimally 1 to 2 hours and can be done for even large groups.